You knew I couldn't let today come and go without posting some further thoughts on China and their moment in the sun. 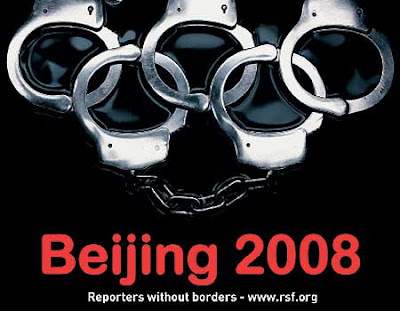 Reuters is reporting today that "[c]ountless Chinese will stay locked in on Friday night, watching the Beijing Olympics open on television. Quite a few will do so against their will." That's right, Beijing has put "dissidents" under house arrest. Others have fled to avoid detention, and still more have "been taken on forced 'holidays' by state security minders." All this to ensure "safety." Tiananmen Square has been completely shut down and "more than 100,000 police and troops" are keeping a very close eye on everyone, lest someone be tempted to detract from the festivities and mention something like Tibet. Or Darfur. Or Burma. Or Taiwan. We'll see a lot of coverage of fireworks and flag waving. We'll see photos of world leaders smiling and looking on, an air of joviality prevailing. But the violent truth will hang about the games like the polluted haze which covers Beijing. I hope that this heightened attention to Beijing proves somehow liberating for millions they oppress. A continued, open dialogue among us all is a beginning, at least. Want more? Check out Reporters Without Borders. Dawn, thanks so much for your encouragement. And thanks for reading! I have a lighter side too, I promise!